Ariana Grande has apologised for "startling" her fans with her brain scan images, after they were left concerned for the singer's health. The 'Thank U, Next' hitmaker shared a scan of her brain showing "hilarious and terrifying" levels of PTSD - which she endured as a result of the Manchester terror attack at her concert in May 2017 - on social media on Friday, and the scary image has caused her fans to worry about her health. But to put her fans at ease, Ariana has said she "didn't mean" to scare anyone with the picture, and simply found the scan "interesting". She wrote on her Instagram story: "Didn't mean to startle anyone with my brain thingy. It just blew me away. I found it informative and interesting and wanted to encourage ya'll to make sure you check on your brains / listen to your bodies / take care of yourselves too." The 25-year-old singer then promised to "talk more about" her PTSD when she feels ready and is "more healed up", and said she's "constantly working" on improving her mental health. She added: "I love science and seeing the physical reality of what's going on in there was incredible to me. I mean, I feel it all the time, but seeing it is totally different and super cool. Someday, when I'm feeling ready or when I'm more healed up, we can talk more about it. I am constantly working on my health / learning how to process pain (aren't we all). Everyday is different but I'm doing my best. "Just know I will continue showing up and giving as much of my energy as I can and do my best even tho my brain looks like the world map. (That's why her hair's so big, it's full of trauma...k ariana, log off) Love u. (sic)"
The 'God is a Woman' singer had originally taken to her Instagram Story to share a text chain she'd sent to a group, which included two images side by side showing a "healthy brain" with few outlines next to a "PTSD brain", which had a number of highlighted spots. She had then added: "guys.... my brain." Underneath her brief caption was a larger brain image, and though it was in black and white, the very high levels of highlighting were clearly visible. Ariana Grande is suffering from "hilarious and terrifying" levels of PTSD, she revealed on Instagram. The 'Thank U, Next' singer has previously spoken of how she experienced post-traumatic stress disorder (PTSD) in the aftermath of the Manchester terror attack at her concert in May 2017 and she's now showed fans brain scan images to show how much she's been affected. 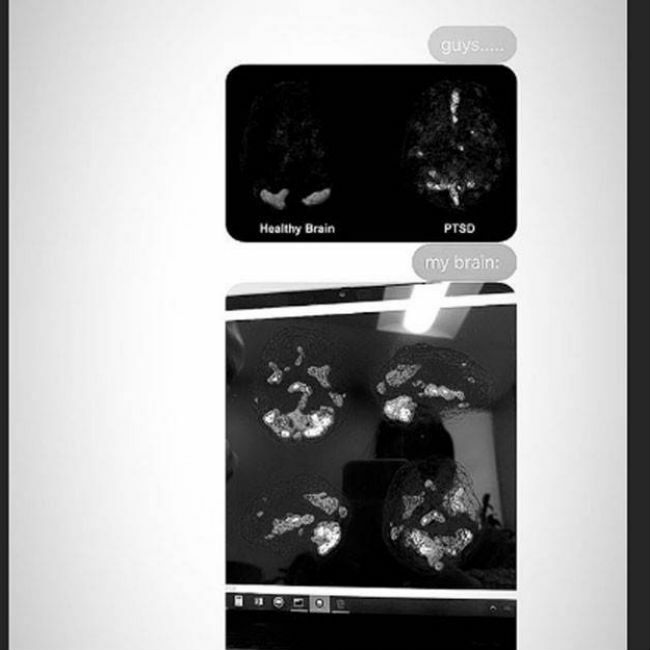 Ariana took to her Instagram Story to share a text chain she'd sent to a group, which included two images side by side showing a "healthy brain" with few outlines next to a "PTSD brain", which had a number of highlighted spots. It isn't clear why Ariana had undergone a brain scan. The 'No Tears Left To Cry' hitmaker spoke last summer about how the dizziness and anxiety she felt were signs of PTSD. She said: "I hate ... yeah ... admitting it but it very much is. That's what everyone was telling me. It's hard to talk about because so many people have suffered such severe, tremendous loss. "But, yeah, it's a real thing. I know those families and my fans, and everyone there experienced a tremendous amount of it as well." Ariana is reluctant to open up about her own experiences because of the suffering felt by others after the terrorist attack, which killed 22 and injured hundreds more, but admitted she struggles to speak about it without breaking down. She added: "Time is the biggest thing. I feel like I shouldn't even be talking about my own experience - like I shouldn't even say anything. I don't think I'll ever know how to talk about it and not cry."